Investing Advice And InformationPoliticsDeficits Fall: Is Gridlock Good? Deficits Fall: Is Gridlock Good? A mild recovery in the economy, combined with tax hikes and a spending slowdown, resulted in a sharply falling annual federal deficit — from $1.5 trillion two years ago to $600 billion today. Chris Edwards of the Cato Institute has just released a series of charts showing a definite slowdown in federal spending since the Republicans took over the House in 2011. See “spending charts” under www.DownsizingGovernment.org. Click the chart “U.S. government,” and you will see that the growth of government has slowed down remarkably in the past few years. Gridlock works! When the Republicans were in control of the federal government from 2001-2008, government spending exploded. When the Democrats were in control (2009-2011), they pushed through ObamaCare and Dodd-Frank and kept the spending up. Now, the House Republicans are limiting government — a good thing. 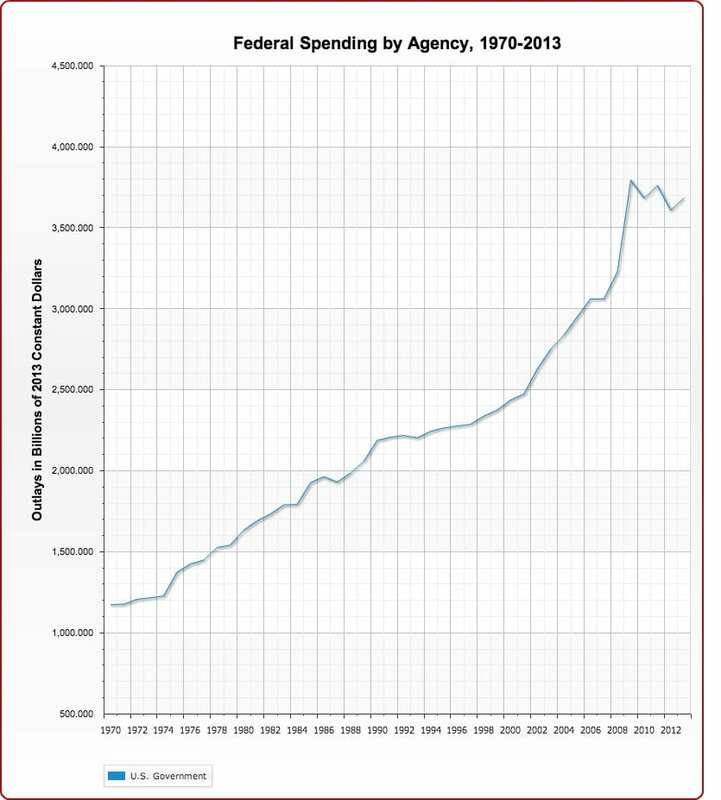 If you look at the breakdown of government spending by agencies, you find a downward trend in the past few years. Of the 27 categories, 15 are in decline — including Commerce, Defense (! ), Energy, Education (a real waste! ), Labor, Treasury, Environmental Protection Agency (hooray! ), NASA and the Small Business Administration. The spending of four other agencies has flattened. They include Homeland Security, Health and Human Services (food stamps!) and Housing and Urban Development. And spending for eight agencies is moving up, sharply in certain cases, including Agriculture (for no good reason), Veteran Affairs (all those wars), foreign aid (why?) and Social Security (no surprise there). It looks like there still is plenty of room to cut back. Come “Crash the Party,” Saturday, Oct. 19, Westin LAX: Martin Truax, a long-time friend and senior vice president at Raymond James & Associates, is organizing a one-day “Crash the Party” seminar on Saturday, October 19, 2013, at the Westin Los Angeles Airport Hotel in recognition of the 1987 crash and my birthday. This event is ideal, since travelers simply can fly into LAX and take the Westin shuttle to the hotel (only $109 a night). He has invited several top financial experts who will assess the chances of another crash or bear market, given the artificial nature of this Fed-driven market. In addition to Martin Truax and me, they include Wellington Letter editor Bert Dohmen, Washington insider Floyd Brown, money manager Adrian Day, #1 real estate guru Jack Reed, coin expert Van Simmons and Everbank President Frank Trotter. We’ve also just confirmed Jeff Phillips, venture capitalist and investment banker extraordinaire, who has made many of us (including me) extremely wealthy with his pre-IPO stock picks. He’s going to give us two recommendations at our one-day seminar. The price for this event is only $99 per person, with $50 for additional guests. Come crash the party! Details at www.lainvestmentconference.org. To register, call Steve at 678/333-5361, or email lainvestconference@att.net. Like most Americans, I have an intense dislike of the IRS — misnamed the Internal Revenue Service. Talk about Newspeak. The IRS is not “internal” — it taxes Americans around the globe… “revenue” is just a nice word for “taxes”… nor is it a “service” to us as taxpayers. It’s a taxing authority, damn it. Let’s call a spade a spade. “Federal Tax Authority” (FTA) should be its proper name. What is really annoying are the IRS’ failed efforts to improve “customer service.” Recently, I got a bill related to my publishing business where they claimed my company owed them an additional $553.10. Of course, it was impossible to figure out how they came up with this additional tax, plus penalties and interest (always). So, I needed to call them on their handy 800 number. But guess what? Everytime you call them, you are put on hold with the announcement, “the waiting time will be more than 30 minutes.” I’ve called several times, and it’s always “more than 30 minutes.” Who has time to sit around waiting for the IRS to respond? The IRS budget has been increased dramatically over the years, but will they increase customer service? No way. Then I see that the notice I received gave me just two weeks before I was supposed to send the IRS a check. Otherwise, more penalties and interest would accrue. No wonder everyone calls the IRS the “infernal” revenue service. Well deserved. Although the minutes from the Federal Reserve's recent meeting indicate broad support for reducing the Fed’s $85 billion a month stimulus program this year, no specific start date has been determined.